In 1958, architect and architectural writer and critic, Robin Boyd, built a house for his family on a narrow, sloping block of land in Walsh Street, South Yarra. The block was part of a small side garden annexed from a larger property, with the existing house retained to the north of the newly acquired Boyd site. Although a private garden was located on the south side, Boyd was aware of the possibility of future development. Located on the east side of Walsh Street, the sloping block had a view of the Dandenongs to the rear. These site features resulted in an introverted plan for privacy, withan emphasis on the rear view and an internal courtyard. The house was sited to preserve a still existing Monterey Pine (Pinus radiata) at the front. 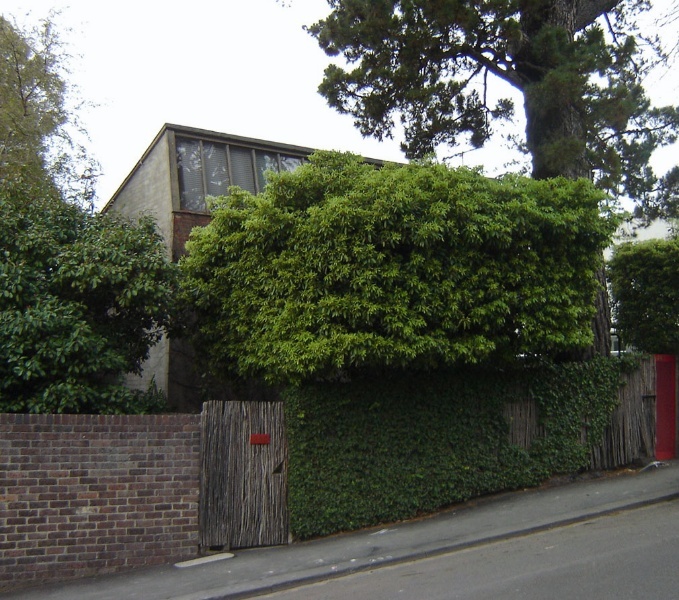 This house was the second Robin Boyd designed for his family, the first being built at 158 (now 664-666) Riversdale Road, Camberwell in 1946 (H0879). Influenced by architectural trends overseas, Boyd was a supporter of the functionalist manner of the International Style, although he viewed it in an Australian context. At Camberwell he experimented with open plan living, adopting a stretched linear plan of two interlocking rectangular blocks. 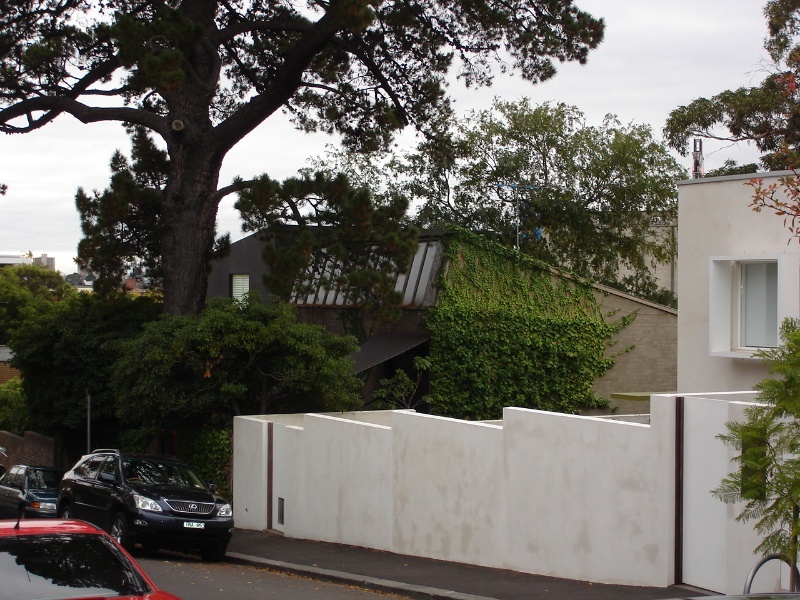 In response to this, Boyd's South Yarra design used zoning to temper the effect of open planning on adults and children living together in a family house. 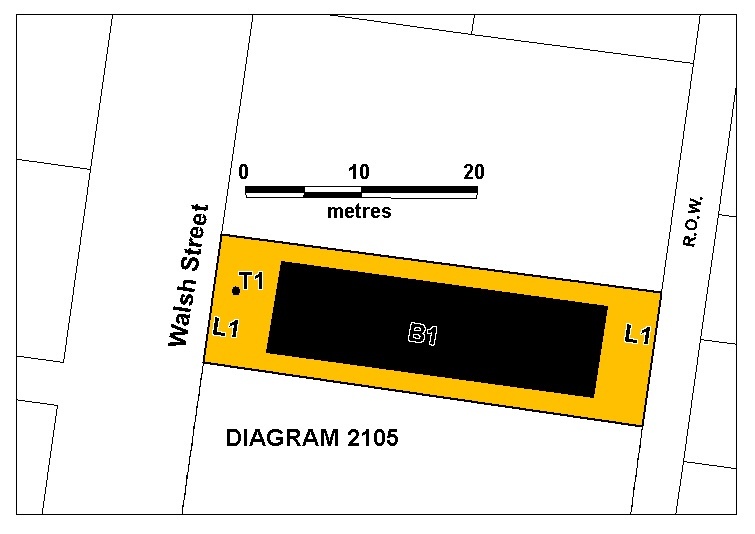 At Walsh Street, Boyd divided adults and children into two zones, separated by an open courtyard. This tripartite design was tied together by a single cable-hung roof which flowed from the two storey section at the front to the single storey section at the rear, with an opening over the central courtyard. In 1963, Boyd described his family plan in terms ofthe creation of mutual privacy within one shared home. To accomplish the separate parent and children zones, Boyd employed an innovative tension roof structure of cables draped from the front of the house to the back, tied at the ends to steel frames and propped at intervals by timber posts. Catenary curves of timber planks supported on wire cables resulted between the supports. Side walls are constructed of cavity brick, originally painted in earthy tones both inside and outside, and internal walls are of jarrah lined timber. Joinery is of limed mountain ash, the lower front section has a brick floor and the roof is of built-up felt over timber decking. The introverted nature of the house is emphasised by the brutal front brick facade with an asymmetrically placed, canopied flight of splayed stairs leading to the front door and a strip of high windows. As a result, the form of the building cannot be fully understood from the street and the intimacy of the interior is not evident. Internal spaces are orientated inwards to the courtyard, itself a distinct space within the building, and fully glazed walls allow visual communication between the two separate building blocks through the courtyard. They also allow the controlled penetration of daylight, with little direct sun entering the front section of the house, but plentiful, diffuse light being reflected from the court. The external view to the east of the property is cleverly utilised from the upper level space, through the courtyard aperture and beyond. The two-level, front section of the house contains a floating platform, visually suspended in the space, allowing it to be read as one volume. This platform, at entry level, contains the combined formal living area, master bedroom and Boyd's study, and is set in from the side walls with the strategic and permanent positioning of furniture used as balustrading. This platform projects as a cantilevered balcony, originally unbalustraded but now balustraded along its length, into the courtyard space. Stairs lead down to the less formal family, dining and kitchen space, from which access is provided to the central courtyard. The side walls of the court are glazed, obscure on the north for privacy, and covered walkways either side lead to the rear children's section of the house. The latter is also glazed to the courtyard, with a bedroom and study directly accessed from the court, and two more private bedrooms and a bathroom accessed from the study. A space for two cars is located under the rear section, with access from the lane behind. The courtyard provided an external living area and originally included a grassed area and a section of red gum block paving, flanked by vegetation in pebbled beds, and brick paved side paths. The grassed section was replaced at a very early stage with large, irregular slabs of slate. On Robin Boyd's death in 1971, his widow Patricia continued to live in the house until it was sold in 2004. It was purchased by the Robin Boyd Foundation Limited formed by the National Trust of Australia (Victoria). Few changes have been made to the house. The bathroom in the rear section was remodelled in the late 1970s or early 1980s by architect Guilford Bell. The Robin Boyd II House, Walsh Street, South Yarra is of architectural and historical significance to the State of Victoria. 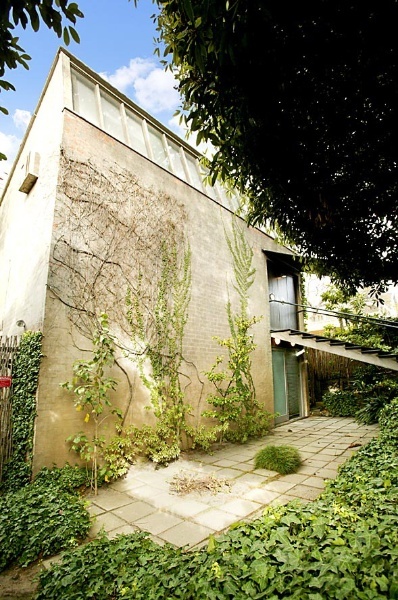 The Robin Boyd II House, South Yarra is of architectural significance as one of the most innovative houses built in Victoria in the post war decades and as one of the most important houses designed by prominent Melbourne architect and architectural critic, Robin Boyd. Designed for himself and his family, it exemplifies many of the theories espoused in his extensive writings and is an outstanding and unique example of his structural-functional architectural type. It clearly displays his theory of a single controlling structural idea, in this case a highly innovative draped roof supported on cables, which encompasses a central courtyard and two distinct zoned areas, one containing a floating platform. The cleverly conceived courtyard house exhibits structural clarity, radical zoning, flowing spatial arrangements and incorporates the inventive use of materials, detail and built-in furniture. As one of a number of innovative and influential modern houses designed in Melbourne in the 1950s and 1960s by a group of progressive architects, it is an important example of modern design inserted into an established suburban area and is innovative in its response to a narrow inner suburban block. It is also significant for its integrity and the intactness of its structure. Yarra by the National Trust of Australia (Victoria). The house contains a collection of manuscripts, architectural plans and other archival material, which has not yet been recorded in an inventory. The Robin Boyd II House is of architectural significance as a house of international importance as shown by its inclusion in such journals as Japan Interior Design in 1962, The Architectural Review, London in 1960 and 1963 and J M Richard's New Buildings in the Commonwealth, London 1961. Its inclusion in such Australian journals as Architecture in Australia and The Australian Journal of Architecture and Arts ensured its importance at a national level. Its inclusion as an example of 20th century domestic work in Australia in later editions of the authoritative British book, Banister Fletcher, A History of Architecture, confirms its continuing international significance. The Robin Boyd II House is of historical significance for its direct association with acclaimed architect and architectural critic, Robin Boyd, a member of a well known Melbourne family of artists and writers. He lived there from 1959 until his death in 1971 and the house then remained in the Boyd family until 2004. For much of his career, Boyd was Australia's best known architect, and is arguably the most influential architect there has been in Australia. Well known for both his buildings and his writings, he became a leader of his profession. Boyd also influenced the general community through his prolific writings about architecture and the environment, in which he challenged Australian complacency and became an arbiter of taste and standards. In 1958, architect and architectural writer and critic, Robin Boyd, built a house for his family on a narrow, sloping block of land in Walsh Street, South Yarra. The block was part of a small side garden annexed from a larger property, with the existing house retained to the north of the newly acquired Boyd site. Although a private garden was located on the south side, Boyd was aware of the possibility of future development. Located on the east side of Walsh Street, the sloping block had a view of the Dandenongs to the rear. These site features resulted in an introverted plan for privacy with an emphasis on the rear view. The house was sited to preserve an existing Monterey Pine (Pinus radiata) at the front, which remains extant. Born in Melbourne in 1919, Robin Gerard Penleigh Boyd was first articled to the architect Kingsley A. Henderson. After the war he worked with Kevin Pethebridge and Frank Bell and from 1947 to 1953, was in sole practice. From 1953 to 1962, Boyd was in partnership with Frederick Romberg and Roy Grounds, generally undertaking the firm's domestic work, and from 1962 until his premature death in 1971 was in partnership with Romberg. He played a significant role in the development of Melbourne architecture in his role as Director of the RVIA Small Homes Service from 1947 to 1953 and his extensive writings on architecture were highly influential. He wrote for newspapers and journals, both local and internationally, and wrote such well known books as Victoria Modern, 1947, Australia's Home, 1952, The Australian Ugliness, 1960, Kenzo Tange , 1962, The Walls Around Us, 1962, The New Architecture, 1963, The Puzzle of Architecture, 1965, the Book of Melbourne and Canberra , 1966, New Directions in Japanese Architecture , 1968 and Living in Australia, 1970. Boyd travelled extensively and was influenced by architectural trends overseas. He admired the work of such architects as Frank Lloyd Wright, Walter Gropius, Mies van der Rohe and Le Corbusier and was a supporter of the Functionalist manner of the International Movement, although wanted it viewed in an Australian context. The architecture that Boyd sought was both regionalist and modernist. Robin Boyd designed about 100 houses, thirty between 1954 and 1960. Four of these are on the Victorian Heritage Register; the Clemson House, Kew, 1959-60 (H2006), the former Robin Boyd House, Camberwell, 1946-7 (H0879), the Inge and Graeme King House, Warrandyte, 1951 (H1313) and the Ctesiphon Concrete Supermarket and Residence, Ashwood, 1952 (H1377). The structural ingenuity of Walsh Street can be compared to examples by other architects in the 1950s, such as the Rice House, Eltham 1952 by Kevin Borland, the McIntyre House, Kew 1955 by P & D McIntyre and the McCraith House, Dromana 1956 by Chancellor and Patrick. Boyd's use of a tensile structure can be compared with the important non-domestic examples, the Olympic Swimming Pool 1956 (H1977) by J & P Murphy, Borland and McIntyre and the Myer Music Bowl, 1959 (H1772) by Yuncken Freeman Brothers Griffiths and Simpson. Robin Gerard Penleigh Boyd was born in 1919 in Melbourne, into the famous Boyd family of artists, writers and potters. He was first articled to Kingsley Henderson, c1936, of A. & K. Henderson, architects, while attending evening classes at the Melbourne Technical College, where he completed the Diploma. He then attended the University of Melbourne Architectural Atelier, without obtaining qualifications. Having completed his articles, he worked in several offices including Roy Grounds in 1941. He served in the CMF from 1939 to 1945, in Papua New Guinea 1943-4, but continued his involvement with architecture, entering competitions and preparing designs for houses. In 1943 he married and after the war began a partnership with Kevin Pethebridge and Frank Bell. In 1947 Boyd left to become Director of the Small Homes Service, set up by the RVIA in conjunction with the Age, with the aim of promoting rational house design. He continued to run this until 1953, preparing designs and producing a weekly article, except while overseas in 1950 on the Robert and Ada Haddon Scholarship. At the same time he was writing and lecturing part time at the University of Melbourne. Boyd was editor of the student publication, Smudges from 1939-42 and he wrote his first book, Victoria Modern in 1947. This was followed by Australia's Home in 1952, The Australian Ugliness in 1960, Kenzo Tange , 1962, The Walls Around Us, 1962, The New Architecture, 1963, The Puzzle of Architecture, 1965, the Book of Melbourne and Canberra , 1966, New Directions in Japanese Architecture , 1968 and Living in Australia in 1970. His writing continued, with weekly articles for the Herald, replacing those for the Age. In 1953 Boyd formed a partnership with Frederick Romberg and Roy Grounds and this continued until 1962. Boyd focussed on the domestic commissions for the firm and about a hundred houses were built from his designs. He continued to travel widely and was Fulbright scholar and visiting professor at the Massachusetts Institute of Technology in 1956-7. In 1969 Boyd was awarded the gold medal of the RAIA, became an honorary fellow in 1970 and made its journal Architect a critical force. In 1971 he was appointed Commander, Order of the British Empire (CBE), and after his death in October that year, at the age of 52, he was awarded the 1973 Architecture Critic's medal by the American Institute of Architects. On his death he was Australia's best known architect, and is arguably the most influential architect there has been in Australia. Well known for both his buildings and his writings, he became a leader of his profession and also influenced the general community, the latter through his writings about architecture and the environment, challenging Australian complacency and as an arbiter of taste and standards. This house design is a demonstration of Boyd's ideals as espoused by him in his many writings. He strove for a return to logic and first principles, encouraging simplicity and frankness of structural expression. Boyd was a supporter of the International Movement, but saw that success would only be achieved if the free approach to international modernism was regulated by the Australian climate, materials and way of life. Houses provided the main vehicle for exploring freedom of expression by architects. Home ownership soared in the 1950s and in 1952 post-war restrictions on materials were lifted, although they remained in short supply. Boyd was keen to use new materials and methods and old materials in new ways. Principal design concerns: 1. re-use and refinement of 8 domestic themes eg courtyard house, platforms within a shed, stepped plan, free form; 2. gradual closure of the open plan; 3. strict adherence to truthful and explicit structural expression;4 controlling idea for a building eg series of platforms, living in a garden; 5 functionalism should be related to time and place, allowing freedom of choice in materials, finish, structure and detail. Built in 1958, this highly innovative house, with sweeping cable-supported roof, floating platform and distinct zoning, was the second designed by influential architect and architectural critic, Robin Boyd, for his family. General Conditions: 1. All exempted alterations are to be planned and carried out in a manner which prevents damage to the fabric of the registered place or object. General Conditions: 2. Should it become apparent during further inspection or the carrying out of works that original or previously hidden or inaccessible details of the place or object are revealed which relate to the significance of the place or object, then the exemption covering such works shall cease and Heritage Victoria shall be notified as soon as possible. General Conditions: 3. If there is a conservation policy and plan endorsed by the Executive Director, all works shall be in accordance with it. Note: The existence of a Conservation Management Plan or a Heritage Action Plan endorsed by the Executive Director, Heritage Victoria provides guidance for the management of the heritage values associated with the site. It may not be necessary to obtain a heritage permit for certain works specified in the management plan. General Conditions: 4. Nothing in this determination prevents the Executive Director from amending or rescinding all or any of the permit exemptions. General Conditions: 5. Nothing in this determination exempts owners or their agents from the responsibility to seek relevant planning or building permits from the responsible authorities where applicable. Replanting the same species or cultivar to replace removed plants, to conserve the significant landscape character, plant collections and planting themes. Works or alterations which impact on the exterior and interior of the house, and the internal layout and fittings designed by Robin Boyd are subject to permit applications. This would include the addition of any structures or devices required for the safety of visitors to the house. Future management decisions should have regard to the heritage significance of the place. The ideal way to ensure that the cultural significance of the place is properly addressed and managed would be the preparation of a Conservation Management Plan. 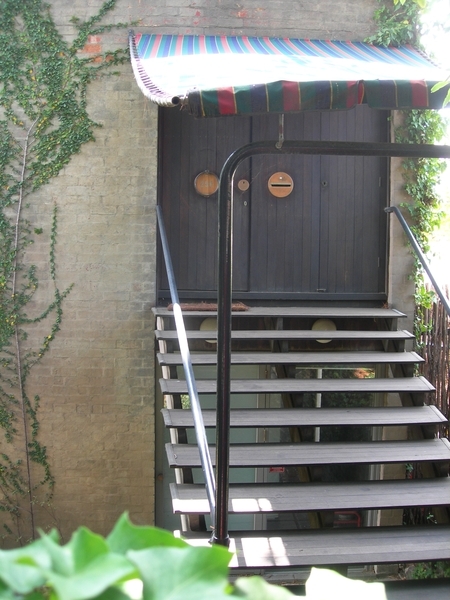 The house contains significant furniture and items, as listed in the Collection Schedule of Furniture and Items at 290 Walsh Street, South Yarra, dated 12 May 2006. It is desirable that a Conservation Management Policy is prepared for this collection. Removal of furniture and items would be subject to permits. The house contains a collection of manuscripts, architectural plans and other archival material which has not been recorded in an inventory. It is desirable that an inventory is undertaken and a Conservation Management Policy prepared for this collection. The approval of the Executive Director would be required prior to the removal of this archival material to the State Library of Victoria or a similar repository. The approval of the Executive Director is required prior to the relocation of any object. The house contains a collection of books that were owned by Robin Boyd. A listing of these should be encouraged for research purposes and included in the archival collection. The purpose of the permit exemptions is to allow works that do not impact on the significance of the place to occur without the need for a permit. Alterations that impact on the significance of the place are subject to permit applications.